When the Alouettes reassembled for practice on Monday, the 2012 Heisman Trophy winner took snaps with the first-stringers before last week's starter, Vernon Adams. 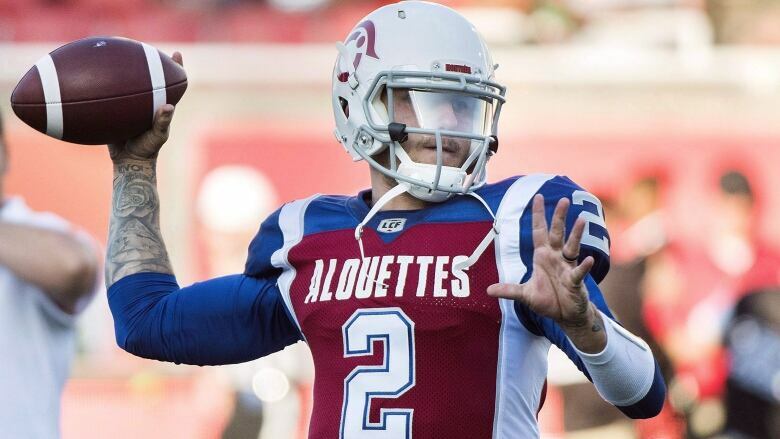 All signs point toward Johnny Manziel getting his first CFL start for the Montreal Alouettes this week. Coach Mike Sherman would not confirm who his starter will be on Friday against the Hamilton Tiger-Cats, but he told reporters to draw their own conclusions. The obvious conclusion would be that Manziel starts, with Adams backing up. "We didn't trade for Johnny to have him sit on the bench, so obviously, Johnny's come over here to get reps and become the best player he can become, and we stated that process today," said Sherman. "You probably all figured it out yourself, but when you have two players you wait till game time to make that announcement. If he starts, Manziel will be the fourth starter and the fifth quarterback overall to play for Montreal (1-5) in six games this season. Both opening day starter Drew Willy and backup Jeff Mathews are injured, which prompted Alouettes GM Kavis Reed to swing a five-player deal with Hamilton to get Manziel, who had been cooling his heels behind Jeremiah Masoli since the start of the season with the Tiger-Cats. Manziel was not made available to reporters on Monday. Adams, who was released by Hamilton and signed for a second stint in Montreal on June 26, looked promising as the starter in last week's 44-23 loss at home to Edmonton. The Alouettes matched a season high in points and could have had more if not for a dropped touchdown pass and three missed field goals. But throughout the game, many fans at Percival Molson Stadium were calling for Manziel, who Sherman wisely kept on the sideline, not wishing to risk injury to an unprepared quarterback who had been acquired only four days earlier and had only two full practices with the team. Some fans were upset because they'd bought tickets to see Manziel, so the pressure is on to get him into a game. But Sherman said he alone will decide who plays. "Last week it was my decision not to play him and what I do this week is my decision," he said. It appears that Adams will be passed over by the Alouettes for a second time. In 2016, he ended the season with three straight wins and was thought to be the starter for 2017, but Montreal opted to go with veteran Darian Durant and Adams was shipped out. "That's why nobody should be surprised," said Adams. "They haven't said anything, but you guys saw today, so we'll see how it goes. "I love football so much. I'm blessed. I can't hang my head. When I'm by myself I have those thoughts that man, this is happening to me again. But if I'm going to sit here and complain about everything, everything's just going to keep getting worse. I just have to keep getting better and better and keep preparing as if I'm going to start." Adams and Manziel are similar quarterbacks in that both are mobile and like to make plays on the run. With Adams behind centre, running back Tyrell Sutton saw as much action catching short passes out of the backfield as he did carrying the ball. "I love it because you can call the same plays for them and they both have that improvisation to their game, something you can't really teach," said Sutton. "I told them they were two of the best college players I've ever seen. "They have a lot of talent and can make things happen not only with their arms but with their legs so it's good to have both of them." The club has not only changed quarterbacks from week to week, but also hasn't had the same set of offensive linemen for two games in a row. That will be the case again after guard Ryan Bomben was traded on Sunday for defensive back T.J. Heath. Cornerback Mitchell White suffered a likely season-ending injury and defensive back Najee Murray tore an ACL against Edmonton. Third-string quarterback Matt Shiltz injured a shoulder against Edmonton, so newcomer Austin Apodaca could fill that role this week. "It's funny, we have three quarterbacks here now who weren't here during training camp, so we're kind of starting from the ground up and working things out," said Sutton. Receiver Adarius Bowman, a three-time CFL all-star acquired last week from Winnipeg, had his first practice in Montreal and should play.